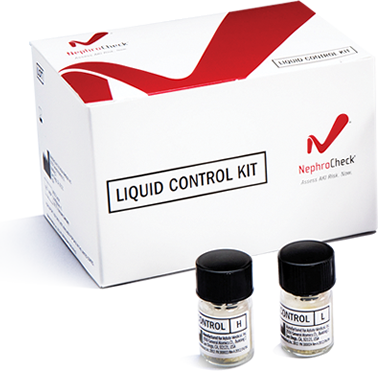 The NephroCheck® Test System is intended to be used in conjunction with clinical evaluation in patients who currently have or have had within the past 24 hours acute cardiovascular and or respiratory compromise and are ICU patients as an aid in the risk assessment for moderate or severe acute kidney injury (AKI) within 12 hours of patient assessment. The NephroCheck® Test System is intended to be used in patients 21 years of age or older. 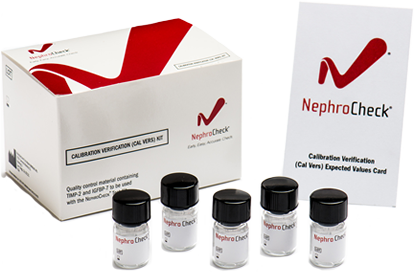 The NephroCheck® Test Kit is a single-use cartridge designed to detect biomarkers of acute kidney injury, TIMP-2 and IGFBP-7. The test provides results in 20 minutes. 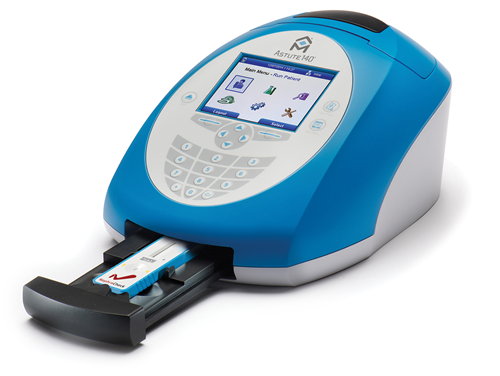 The test procedure involves the operator applying a fresh or thawed clinical urine sample (mixed with labeled fluorescent conjugate) to the NephroCheck® Test Cartridge, then inserting the test cartridge into the Astute140® Meter for incubation, reading, result calculation and result display. Each NephroCheck® Test Cartridge contains RFID cards to ensure kit expiration date and lot-specific information is downloaded. 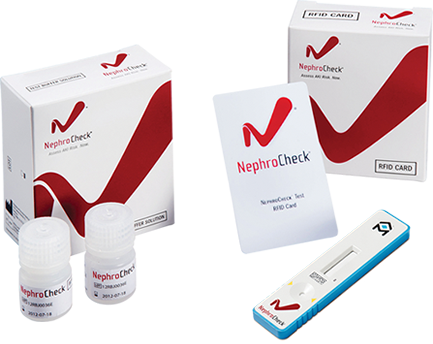 Each cartridge also includes two detection zones that serve as procedural controls (one positive and one negative) that are run automatically with every sample to confirm that the NephroCheck® Test procedure is performed correctly. Click here to download the package insert for product stored at 4-25°C. Click here to download package insert for product stored at 2-8°C. Click here to download the SDS for product stored at 4-25°C. Click here to download the SDS for product stored at 2-8°C. Click here to download the SDS. 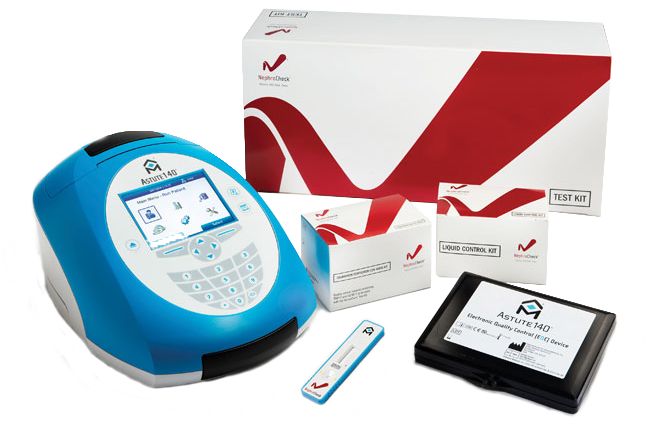 The Astute140® Meter is a bench-top/tabletop analyzer that converts the fluorescent signal from each of the two biomarker assays, TIMP-2 and IGFBP-7, contained within the Test Cartridge into a single numerical result. The NephroCheck® Test results are available on the Astute140® Meter in approximately 20 minutes. The EQC procedure verifies the calibration of the Astute140® Meter to confirm that the meter is functioning properly, including the following Meter systems: positioning system, optic system and other internal systems. 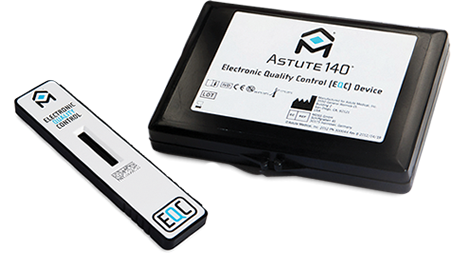 It is recommended that the Astute140® EQC procedure be run daily, in accordance with your local, state, and/or federal regulations or accreditation requirements and standard quality control procedures. Click here for NephroCheck® Test training curriculum (customers only). ©2018 Astute Medical, Inc. Astute Medical®, the AM logo, Astute140®, NephroCheck®, the NephroCheck® logo and AKIRisk® are registered trademarks of Astute Medical, Inc. in the United States. For information regarding trademarks and other intellectual property applicable to this product, including international trademarks, please see www.AstuteMedical.com/US/About/IntellectualProperty.